The North Carolina Mutual Life Insurance Company advertised life insurance for slaves between the ages of 10 to 60 in the Raleigh Register. The advertisement listed the directors and officers of the company. Life insurance for slaves demonstrates the complex economic character of the institution of slavery, profiting not only slaveholders, but also many other white southerners. Through the antebellum era, the institution of slavery generated approximately $12 million of business per year through ancillary activities, such as life insurance, and also banking, auctioning, and textile manufacturing. 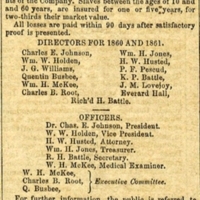 "ADVERTISEMENT FOR COLT FIREARMS//SLAVE INSURANCE!," Mitchell Archives, accessed February 27, 2012, http://mitchellarchives.com/front-page-advertisement-for-sam-colt-firearms.htm. This company takes risks upon all healthy lives between the ages of 14 and 60 years--for one year, for seven years, or for life--the assurers for life participating in the profits of the Company. Slaves between the ages of 10 and 60 years, are insured for one or five years, for two-thirds of their market value. North Carolina Mutual Life Insurance Company, "North Carolina Mutual Life Insurance Company," Raleigh Register, March 21, 1861, Civil War Era NC, accessed April 24, 2019, https://cwnc.omeka.chass.ncsu.edu/items/show/131.